Network microscopy has never been easier! Taking the next step in classroom management, Motic Net allows digital microscopes running with Motic Images Application systems to be linked so that one teacher can have full and instant access to any student at any time. Having a live image transmitted at high-speed directly from the microscope to the computer means that students no longer have to fight over who gets to look through the eyepiece. With Motic Net, teachers can promote team work and group thinking easily. With a live overview of each student’s Digital Microscope Station, the teacher knows instantly what’s going on at each station and can focus on presenting the actual teaching material. This overview can be extended to cover up to 48 individual computer stations so that even a larger class size can be covered by just one teacher. Technology like this is vital in the course of ensuring that no student is left behind. 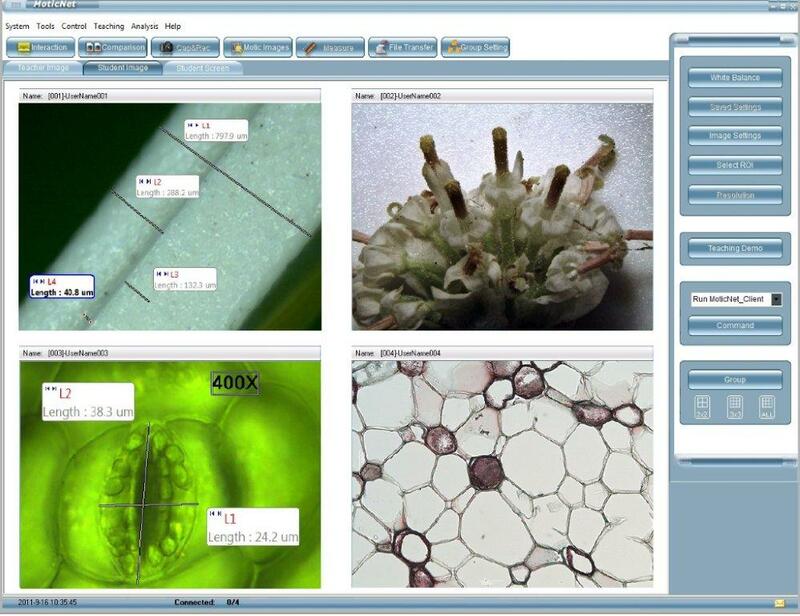 With Digital Microscopy at its core, not only does the teacher have a complete overview of each student station, they also control and manipulate the quality and color of each student’s microscope image. Instead of having to walk around the classroom looking down at each student’s microscope before adjusting it, a teacher can now adjust every student’s image from one central station. Other teaching tools have been integrated into the software and are the core of classroom networking. With text-based programs like instant messages, the teacher can communicate with every student from their work station. Keeping "no student left behind" in mind, Motic Net also includes an integrated digital audio communication system; all you have to do is equip each computer with a headset and microphone. Motic Net expands its usefulness outside of teaching with microscopes and becomes even more versatile in the classroom.